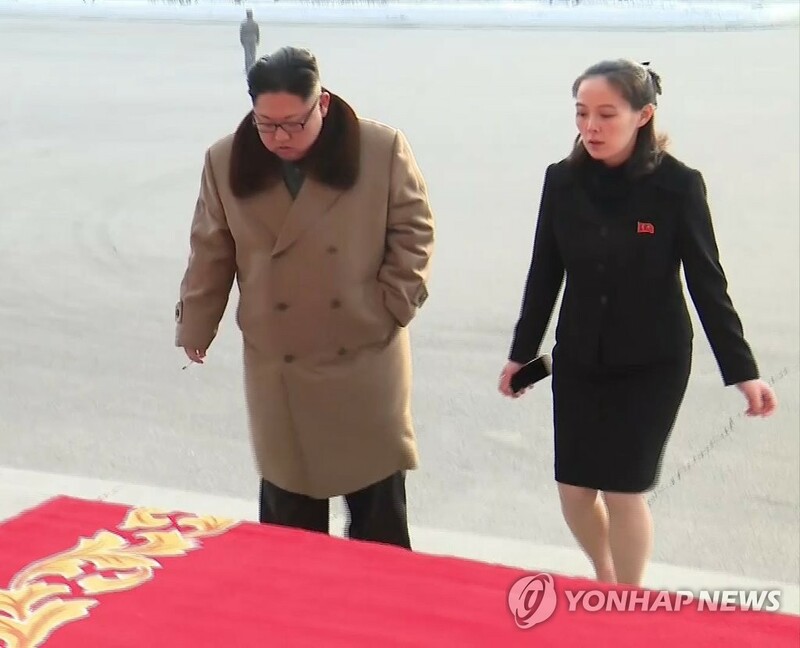 SEOUL, March 12 (Yonhap) -- North Korean leader Kim Jong-un appears to have not made it onto a list of deputies newly elected to the communist state's rubber-stamp parliament, while his sister did, raising speculation about the reason behind the decision. Kim's name was not mentioned when the Korean Central Broadcasting Station, a state radio network, called out the names one by one of all 687 deputies elected to the 14th Supreme People's Assembly in Sunday's nationwide polls. Kim's exclusion from the list means he didn't run. Elections in North Korea are a formality, with all candidates getting elected with 100 percent of the vote. State media did not mention Kim's candidate registration before or after the elections. It was unclear why Kim decided not to run and what the decision means for the country. But regardless of the reason, the decision doesn't appear to suggest that his grip on power is slipping. Some experts said the decision could be part of Kim's efforts to project himself as a leader of a normal state where the executive and legislative branches are separate. Kim was last elected to the assembly in March 2014 when the first parliamentary elections were held since he came to power. He ran for a seat in the Mount Paektu Constituency No. 111, a mountain known to be the sacred birthplace of his late father. Kim's younger sister, Yo-jong was among the newly elected, according to Pyongyang's state media. Foreign Minister Ri Yong-ho and Vice Foreign Minister Choe Son-hui, who led nuclear talks with the United States, appeared to be elected as deputies for the first time. Some of those handling inter-Korean affairs made it to the assembly as well. The list included Ri Son-gwon, chairman of the Committee for the Peaceful Reunification of the Country, and Ri Jong-hyok, vice chairman of the Korean Asia-Pacific Peace Committee. As Pyongyang's media did not show their photos, nor provide details of their job titles, there is a possibility that they could be different people with the same names. The Korean Central News Agency reported that 99.99 percent of eligible voters cast ballots in the Sunday elections and all new deputies were elected with 100 percent of the vote. Elections in North Korea are widely viewed as a formality but the Sunday's elections drew keen attention as they could provide a glimpse into any possible power shift under the young leader. The elections also came after Kim returned home empty-handed from his second summit with U.S. President Donald Trump in Hanoi late last month.